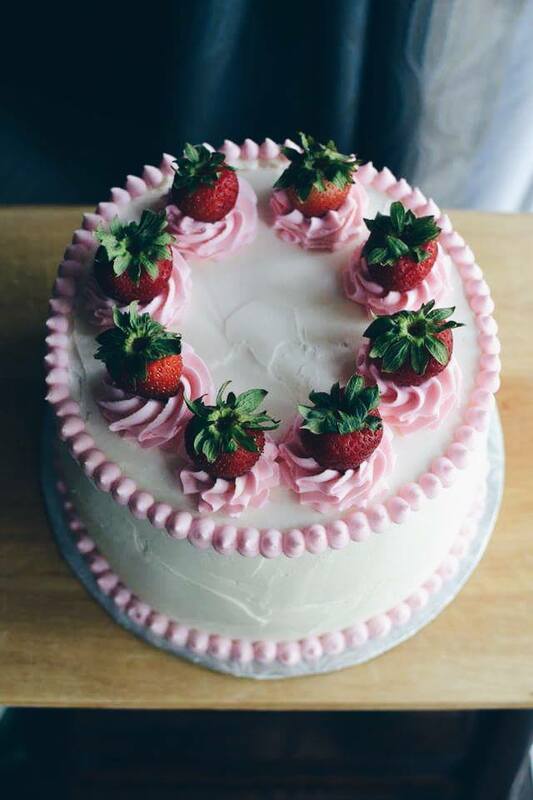 My friend at work requested this strawberries and cream cake for his mom, which I was super excited to do because I love making cakes with strawberries on top. I think it’s the most beautiful little touch (especially when you cover them in chocolate!) 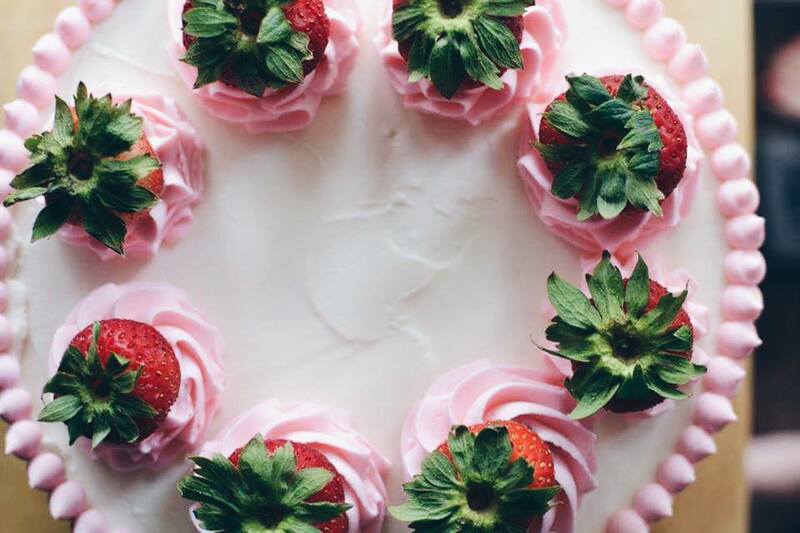 But for this cake, no chocolate was involved. 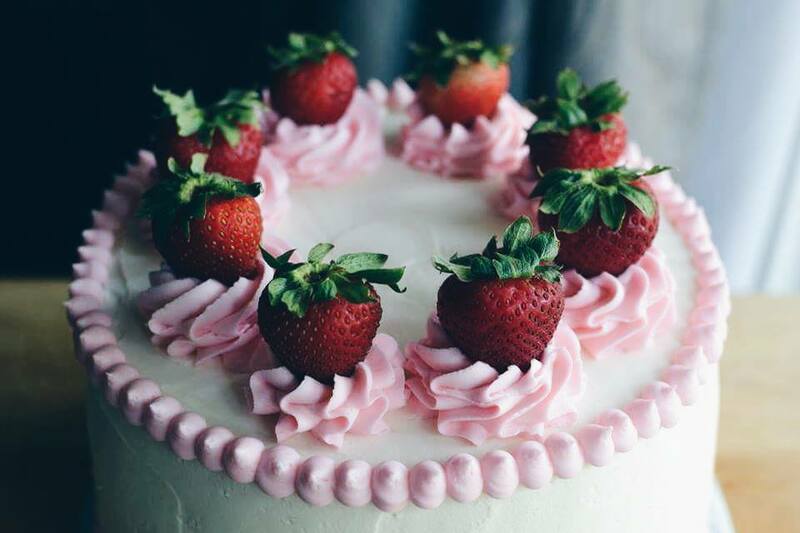 I made four layers of vanilla cake, and in between each layer is a layer of strawberry jam, a layer of sliced strawberries and a layer of whipped cream filling. So I placed one layer of vanilla cake on the bottom, a layer of strawberry jam (I used Smuckers! 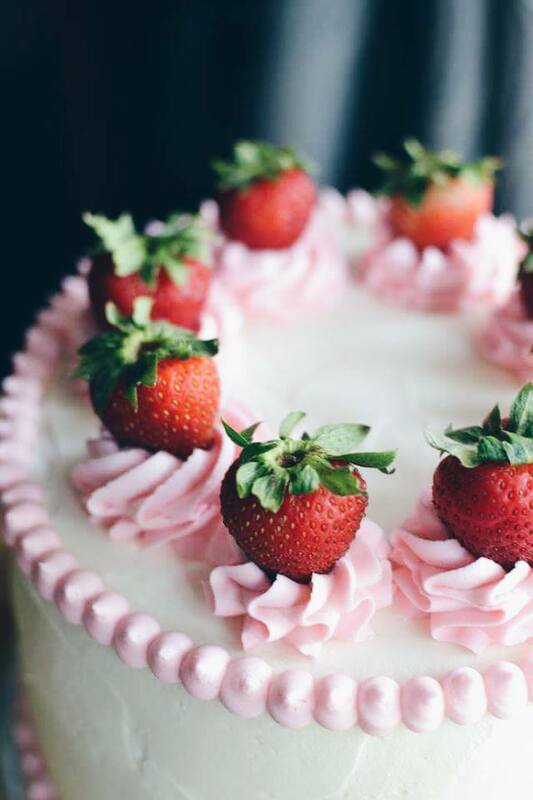 ), a layer of thinly sliced strawberries (1/4 inch or so) and then a layer of whipped cream filling (recipe down below). Then I placed the second layer of cake on top, and repeated the layers until all four layers of cake were stacked. 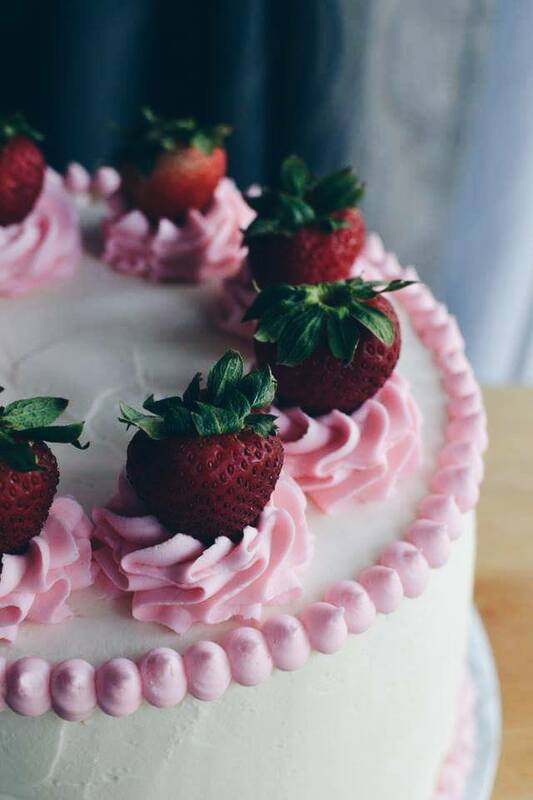 For decoration, I just made vanilla buttercream and dyed it pink. 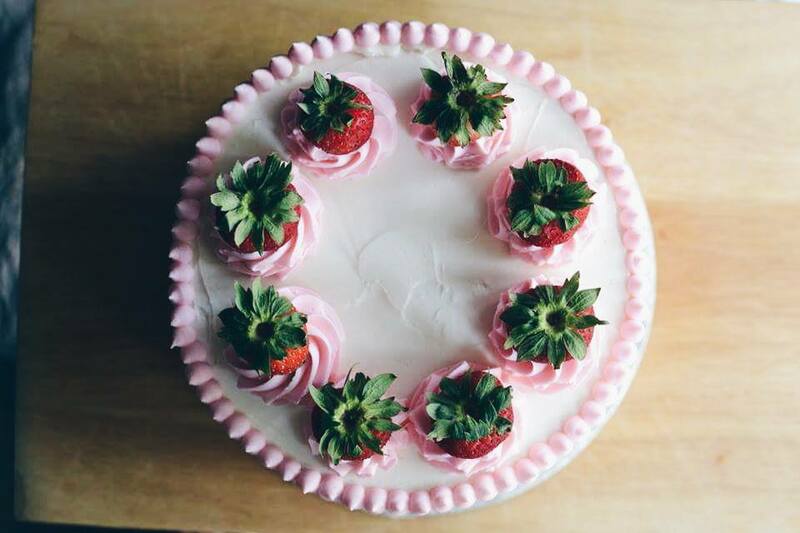 I piped dollops on top and placed strawberries on each dollop. 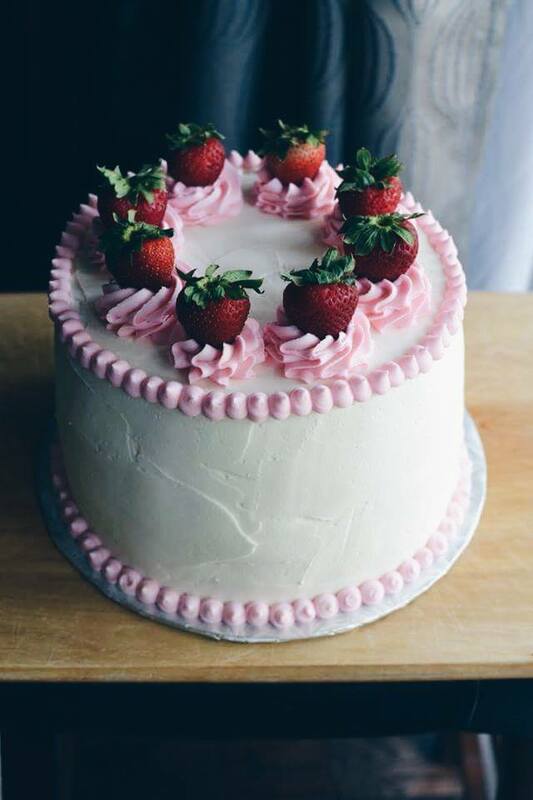 I then trimmed the top and the bottom with little dots of buttercream. Whisk the sugar and cornstarch together in a small saucepan and slowly whisk in 1/2 cup of the cream. Bring the mixture to a simmer over medium heat for 2 to 3 minutes, whisking constantly, until the mixture thickens. Transfer the mixture to a bowl and let it cool to room temperature, about 30 minutes. In a large bowl, whip the remaining 1 1/2 cups cream and the vanilla extract together with an electric mixer on low speed until frothy, about 30 seconds. Increase the speed to medium and continue to whip the cream until it looks thickened, about 30 seconds. Slowly add the cooled cornstarch mixture and continue to whip until the cream forms soft peaks, about 2-3 minutes. Cakes filled with this cream must be refrigerated. Next Post 90th Birthday Flower Cake!